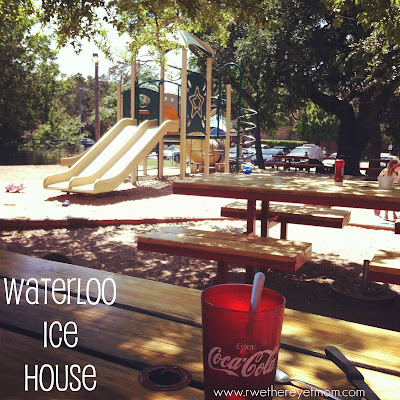 Waterloo Ice House ~ Austin, Texas - R We There Yet Mom? Don’t you love days where unexpected fun just kinda falls in your lap? You go to a place, not knowing what to expect, and you have the best time? My little guy (he’s 3) and I have been exploring every Wednesday as the 2 older kids are in school. It has been so much fun, as we have been able to play at some really cool locations like the Play For All Abilities Park last week. This Wednesday, I had a few errands to run and then I promised him I would take him to a “park” (does a playscape count?). We were meeting some new friends at the Waterloo Ice House on 360/Capital of Texas Hwy. I googled it – saw there was a playscape – thus it became the “park”. We had the BEST afternoon there y’all. 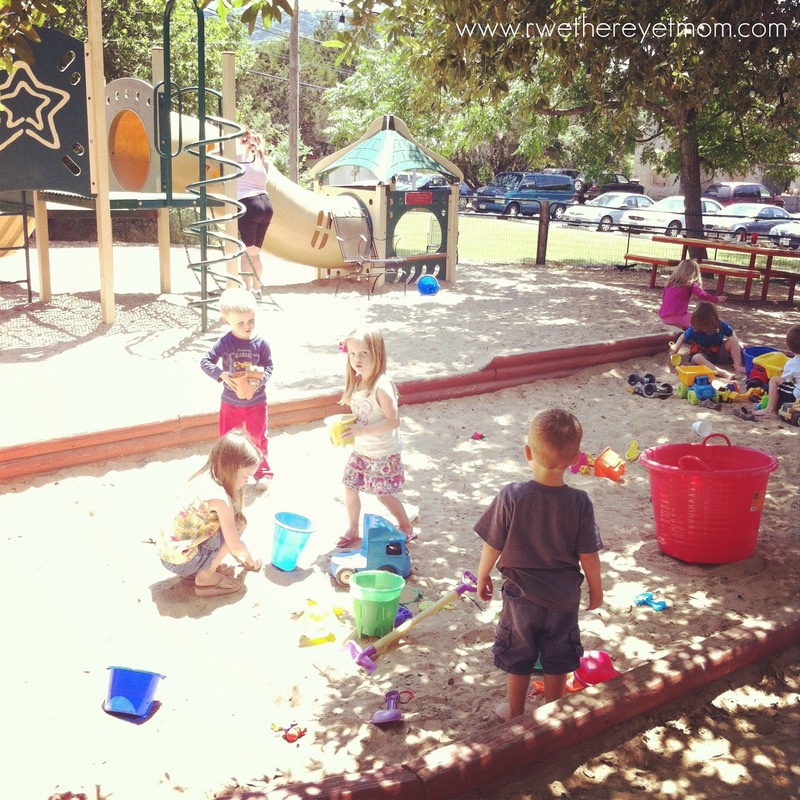 If you are looking for a relaxing weekday location to get the kids out to play – this is it. I was able to drink my ice tea and have a delicious cheeseburger (yes, I indulged!) while my guy ran around the sand pit and playscape for 2 hours. He made new friends, played with trucks, climbed up & down the playscape, and barely came over to get a drink. I sat under the shade of big oak trees, enjoyed the cool April breeze. 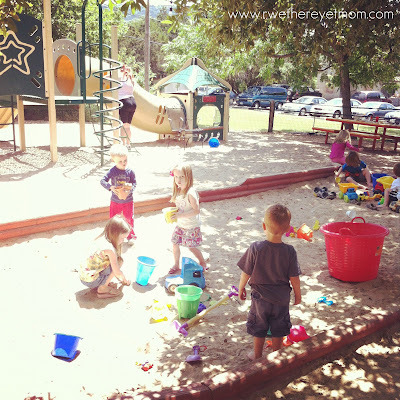 It was incredibly relaxing and I think it could be a great place for play dates. There is a ton of seating and a outside bar that opens in the evening, along with horseshoe pitches and a few tvs. It looked like a great place to hang out on a Friday night with the entire family. I loved the Hill Country feel to it – ice cold beer, burgers in your backyard – can’t get more relaxing than that. Having been around since 1976, Waterloo Ice House has perfected the atmosphere. With 8 locations across Austin, there is definitely one near you….though I can’t say if it has the amazing backyard feel to it that the 360 location does. What? You already knew about this place? You mean, this is not Austin’s best kept secret? Well, consider yourself reminded. Your welcome. 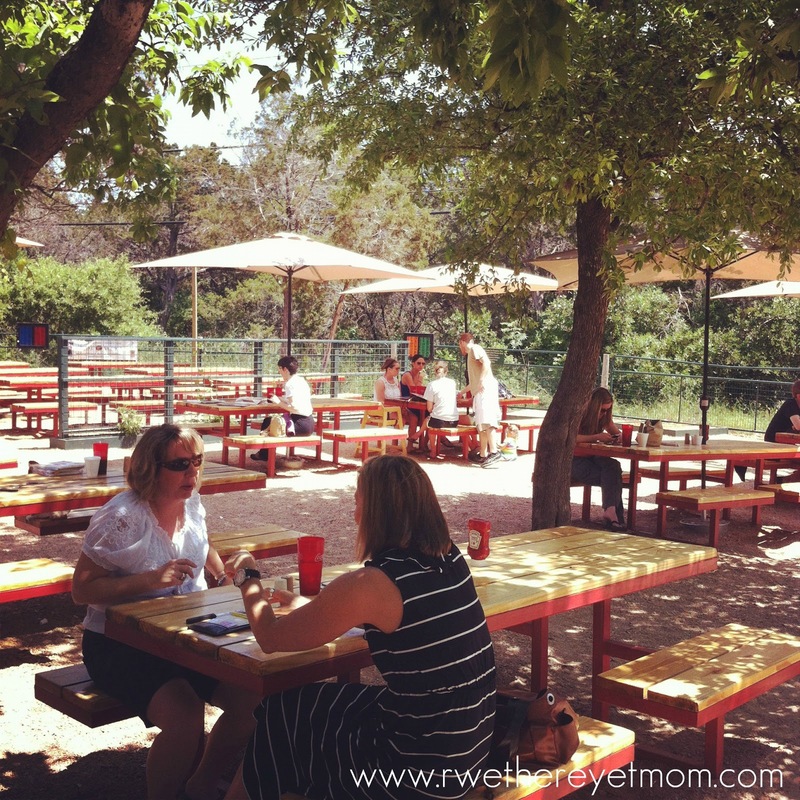 You make me want to pack up and move to Austin! Hell doesn’t have any parks like that. In fact, the one park that I’ve taken Em to had a drug deal going on by the swings. Ugh. I’m just waiting for the days when it’s nice enough to go to a park! Looks so fun for them! And a nice place for mom, too. This is exactly what Waterloo Ice House strives for, a relaxing afternoon or evening for hard working parents, without worrying where their kids are or what they’re doing. Especially at the 360 location (the one you have pictured) where you can see the playground no matter where you are sitting -inside or out! This is one of my favorite places to get together with friends because the kids aren’t begging to go home. We can actually chat! My older boy brings money for the video games. The location up in Avery Ranch has a playground, too. It’s not directly connected to the restaurant, though (shared by the entire strip mall). So, you have to watch your kids a little better.